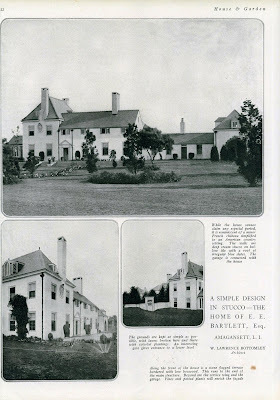 More on the Edward E. Bartlett residence, designed by Hewitt & Bottomley c. 1915 in Amagansett. Click HERE for more on the E.E. 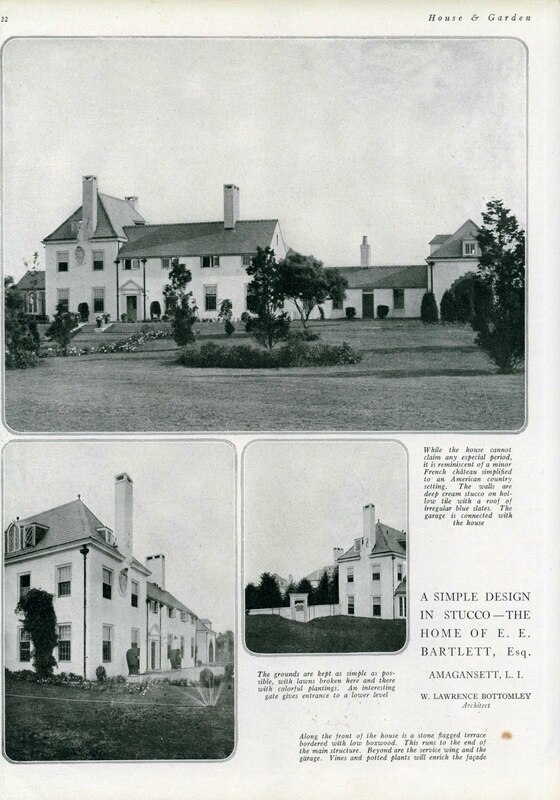 Bartlett residence. Pictures from the Gary Lawrance Collection. 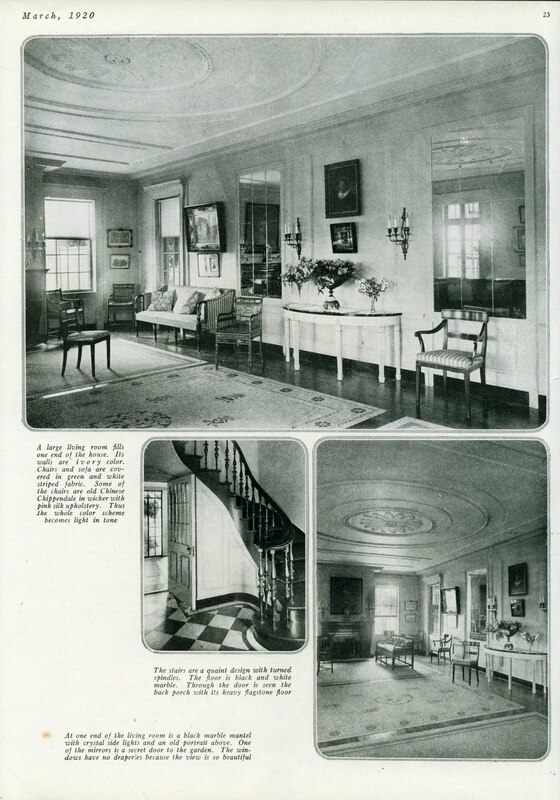 I hope the grandchildren of Mrs. Bartlett comment again- did the interior change much over time, or are these photos much as you remember the house? A small note on how things change: Today, if your house is photographed for one of the "shelter" magazines, a veritable army of "stylists" descend upon you, shifting things around, removing your less photogenic possesions and replacing them with others and generally fluffing and primping things to the point where the resulting photos bear little resemblance to your dearly loved abode. That clearly was not the case up until the 1930's, as many of these early magazine photos attest. Note, for instance, the sprinkler merrily spraying away in the photo of the exterior. Even I, not photographer, would have thought to put it away and roll up the hose out of sight. Wonderful point Magnus. I've been involved in several photo shoots over the years, and am sometimes stunned at the artifice that goes on before. For one, they did not like the lady of the house's terrace furniture, and borrowed mine, (admittedly much chicer :0), and then, borrowed even me to pose with croquet mallet in far background---a long way from the Bartlett sprinkler indeed. When AD did my store years ago, I admit to wishing I could keep the stylist forever. Shop never looked better. well, that's cool---my verification word is seque, just what this comment is. Hello again from Virginia Bartlett's granddaughter!! :) Thank you SO much for your research. Oh, my...these transport me to THE most wonderful times!!! These photos are 1920. We arrived on the spot 35 years later. The grounds were far more lush; but I see the beginnings here. As far as the interior...yes, still much the same. However, in the '50s I recall itchy horsehair sofas in the formal. 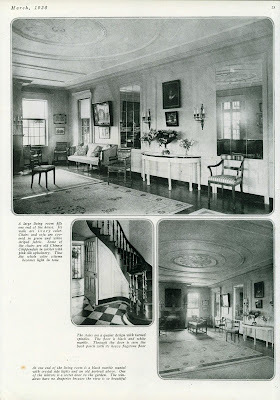 The "sunroom" on the left side of the manse was very light, airy and comfortable. There was a powder room underneath the stairwell that was stunning. I can't tell if it is there in this photo or an addition. I spent around 8 summers here (1960-1968). As far as I can remember the interior stayed almost exactly like the pictures. There was a grand piano in the ballroom that the pictures do not show and there was a glass enclosed room off the ballroom that we called the white room (white carpet, white furniture). We spent many hours playing backgammon in the white room.